New York, New York (September 3, 2015). Dancehall star Konshens schedule has not slowed down at all and in another month will become even busier. Starting end of September Konshens is slated to embark on his two month European tour, which will have him visiting numerous cities throughout Europe. 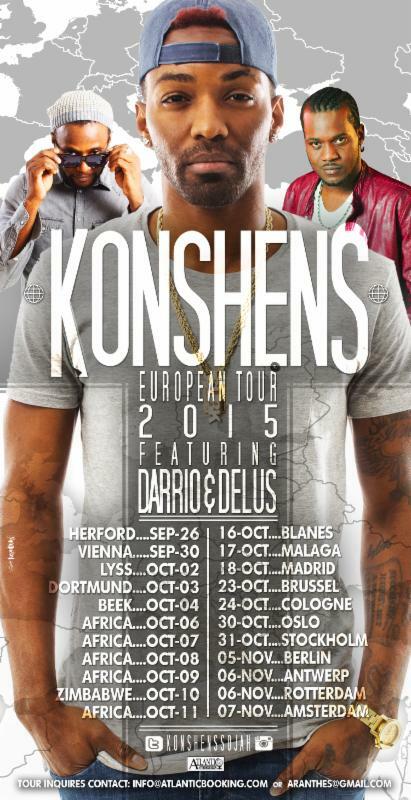 Performing in Europe along with Konshens will be SubKonshus artists Delus and Darrio, who both are no strangers to the European market. Delus who released his EP earlier this year titled ‘Public Relations’ will return to Europe for his second time this year, while Darrio will make his first appearance in Europe for this year since the release of his popular single featuring Konshens titled ‘No New to Gal’. Known for his versatile musical delivery and for entertaining his European crowd with a solid performance from beginning to end, Konshens is looking forward to his return to Europe. “Well I intentionally structured my schedule to be in Jamaica this summer and make sure I got to be a part of all the summer events Sumfest etc. Also wanted to do some real charity work while schools were out. Having done that Im ready to hit the road and bring the love to one of my most faithful fan bases. Im excited and the team is EXTRA excited. This Europe run is gonna be extra special this year too as I got sick last year and had to cancel like 7 shows. Its makeup time! !” says Konshens. Konshens who returned from Kampala, Uganda earlier this week, where he performed alongside Reggae/Dancehall star Busy Signal for one of Uganda’s biggest events for the year ‘Dance With the Champions’ departs for New York tomorrow. While in New York for the big Labour Day weekend Konshens is slated to perform at several major end of summer events including Hot97 Reggae & Soca Tip and DJ Norie Anything Goes.